We are engrossed in the manufacturing, supplying and exporting of a wide range of Louvers Ventilators, which is highly known for its supreme quality. This offered range of ventilators offered by us is inclusive of Louvers Ventilator and Louvers. Furthermore, we assure the durability of the entire range of ventilators offered. 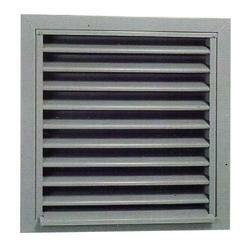 We are involved in offering an extensive range of Louvers Ventilators, which is provided with a self lock structure. Manufactured in adherence to the predefined industry norms, this offered range of ventilators is known for carrying high wind load. To cater to the varied needs and requirements of our esteemed clients, we make these ventilators available in various colors and designs. SLA Slant Aluminum Gray, Black, Brown, Weather wood, White 50/pc. RV 51 High Collar Aluminum Mill, Weather wood 51/pc. RVA 51 Square Aluminum Mill, Black, Brown, Weather wood, White 50/pc. RVG 51 Square Galvanized Mill, Black, Brown, Weather wood 50/pc. RVA 40 Slant Aluminum Mill, Black, Brown, Weather wood 40/pc. RVG 40 Slant Galvanized Mill, Black, Brown, Weather wood 40/pc. RVG 55 Slant Galvanized Mill, Black, Brown, Weather wood 50/pc. Looking for Louvers Ventilators ?